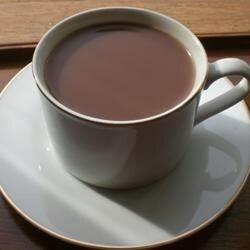 "Mocha coffee is extremely easy to make in this recipe. Just add cocoa, sugar and milk to hot coffee and drink!" Pretty basic mocha recipe. I suggest you do what I did and mix the dry ingredients together and wisk them into the hot coffee in a saucepan, then add a little vanilla flavoring. Quick, easy, and really yummy. Just what I needed on a winter afternoon. I thought this was very good...but I did not add the 1 tablespoon as directed, I used 1.5 teaspoons instead. Also I think it would be good with vanilla or rum flavoring added!